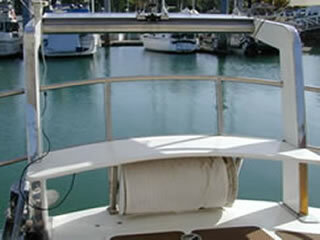 These photos were taken in 2004 at the marina in Townsville. Come aboard for a look around. Approaching illywhacker you will see the exotic bowsprit, the first of many items on deck custom-built in stainless steel by our friend Chris Therin. Also visible are the 2 most deployed anchors - a 65lbCQR on the starboard side and a Fisherman's to port. Our favourite spot to sit on passage is in the comfortable pulpit seat - it's designed to suit a human frame. Rails are made of solid 11/4" ss tubing. A snubber attached to the bobstay tang is ready for use as a shock absorber for the chain. 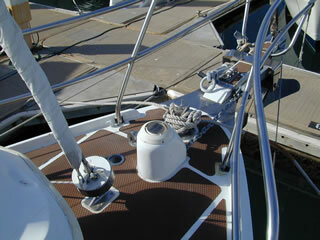 The foredeck has an integrated layout with a stainless Samson post, electric anchor windlass and inner forestay tang. 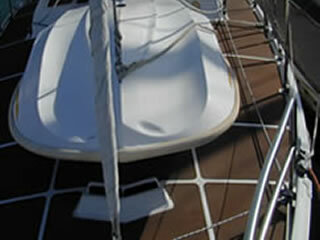 The grp windlass cover has a solar fan designed to draw air from the fwd cabin lockers, chain locker and from the large bow storage locker above. The hard dinghy mounts on permanent chocks facing down as shown or upright to catch water for a bath or rope washing etc. It covers the fwd cabin hatch which can remain open for circulation in the rain. 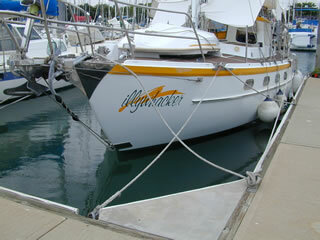 illywhacker has a deckbox built around the saloon hatch (left). The port side shown here contains the 150m parachute anchor rode which is also used for deep water anchoring, while the starboard side has mooring lines, tieup chain lengths, shackles and misc deck lines. The aft deck also has a comfortable seat with 150m of floating line for stern-to mooring. 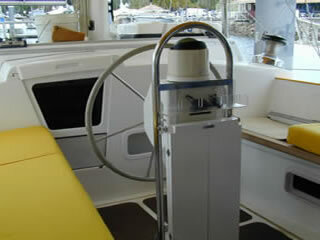 The aft 35lb CQR anchor is shown on the pt side. The dinghy davits are also used for mounting the 60W solar panel, whip and GPS antennae as well carrying the mizzen sheet track. 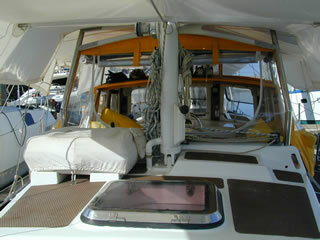 Looking fwd from aft deck into the cockpit (left) under the Summer awning. Aft cabin hatch and 6-man liferaft shown. Looking aft in the cockpit. 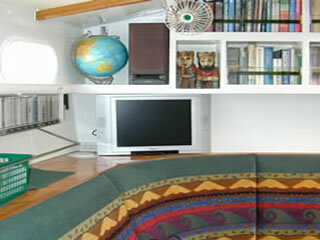 It's all about comfort - note; sitting space not cluttered with winches or cleats, comfortable cushions, sloping seatbacks form the coaming with lockers, deep floor for optimum legroom, cockpit table, rope locker access hole for loose sheets. illywhacker has access to the aft cabin from here, note the insect-net washboard aft. Looking fwd from under the solid doghouse through the opening hatches. 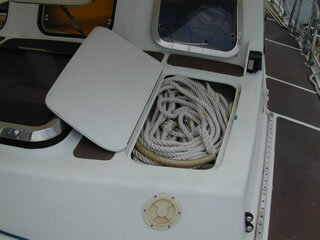 The washboard locker over the main companionway hatch also houses the nav computer. Performance instruments, rudder indicator and VHF remote mount from the deckhead in a removable console. 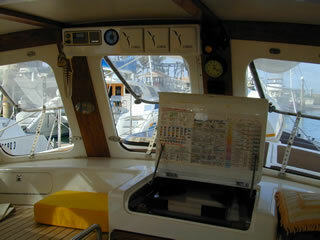 There are 5 screened cockpit ports venting the galley and areas below. 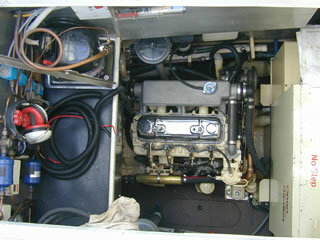 The water filler is shown right in the cockpit floor which slopes aft to twin 75mm drains. Both the deck and cockpit have decktread surfaces - the best wearing non-skid material ever! Descending below decks this photo looks from the galley (portside) across to the aft nav seat and drinks refrig. 8 steps down to the saloon are necessary to achieve 2m headroom. 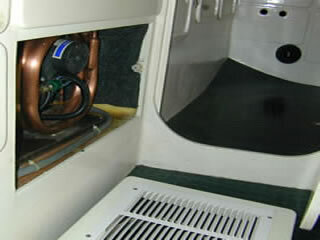 Galley storage drawers are under the steps, the engine-driven heater outlet and the lower left corner of the AC electrical panel are visible to the right. The fwd saloon bulkhead is lined with bookshelves. The fold-out LCD screen is a 12V TV and also connects to the media computer. Looking from saloon to galley showing part of the 3-bowl sink, gimballed microwave /convection oven and separate refrig and freezer. Shelves above have acryllic doors. 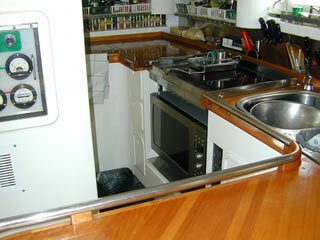 There is a full length recessed shelf to the rear of the galley along the port side. The saloon table is strong enough to sit on! A 1000l water tank beneath the saloon floor is integral with the hull. 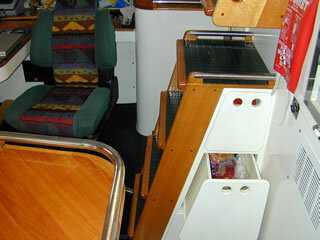 Storage drawers under both seat sqabs and accessible storage under and behind all of the fitout. illywhacker has almost 200 storage lockers, drawers or compartments. No wonder we can't find anything! The modified car seat shown left faces the nav table (not visible here). 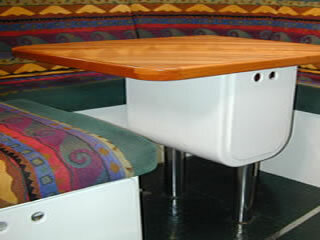 There is a similar chair facing aft - his and her's nav table access! The media computer is fwd of the instruments shown. 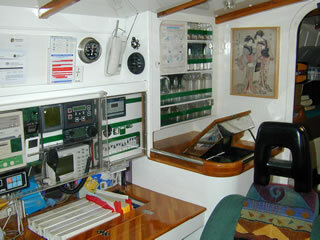 Looking thru the door behind the nav chair is the Navigator's berth (shown below) - underneath the berth are batteries, inverter, isolating transformer, first aid storage and the aft air conditioner shown right. 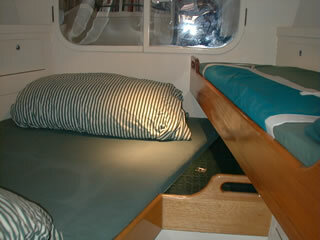 The Navigators berth is the Skipper's favourite at sea. 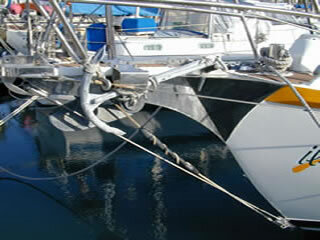 A lee cloth extends from under the hull side up via the leeboard to hooks overhead. 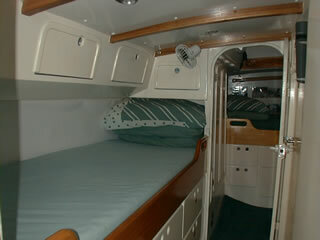 The aft cabin has storage drawers under the innerspring mattresses. 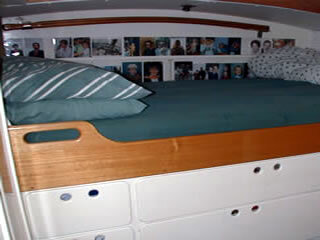 Emergency tiller shown mounted aft - rudder stock is under the mattress. A large lazarette accessed from deck is behind the rear wall. The aft head is to the right, shown below. 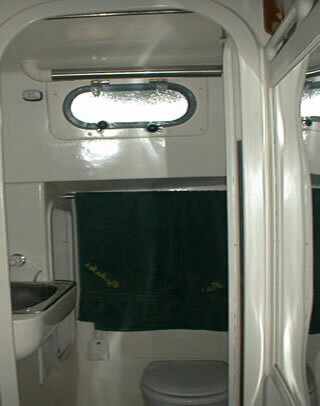 The after head has a shower and toilet with storage behind and beside the head. Access doors to both heads are bifold, running on tracks. They are designed to keep water in and make for an easy entry. The fwd cabin has a double and a single berth which converts to a large, stand-up workbench. Behind the mirrored doors fwd is the large anchor/ stowage locker. The fwd head (not shown) has a shower and toilet and also houses a washing machine. Another air conditioning unit is located in an insulated locker beneath the double bunk, supplying cool air to this cabin and the saloon. The cockpit floor was removed for the photo at left showing the stand-up (almost) engine room. The 240V refr compressor and components mounts on the small work bench at left (aft), the main engine is at centre and the 8KW generator in it's insulated enclosure at right. Beneath the main engine is an exhaust mixer built in to the hull, a 400l fuel tank and a 350l waste holding tank. There is a 600l fuel tank beneath the generator. All tanks, including the 1000l water tanks (2) under the saloon sole, are inside the keel. This is a tremendous advantage for a cruising boat, since under-bunk storage is entirely for supplies etc and not tankage. 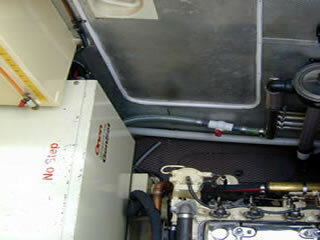 This photo shows the 80l daytank and access door to the engine room, all of which is heavily insulated so that generator noise is almost unnoticeable when running. illywhacker has many more interesting features, some of which are described in this website. However, if you require more information on any specific aspect, please email us - we'd be glad to help.